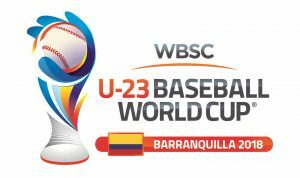 Today marks 30 days before the start of the II WBSC U-23 Baseball World Cup 2018, the most important international baseball competition of the year, to be held in Barranquilla and Monteria, Colombia, from 19-28 October. WBSC has already announced the composition of the groups for the global event and official world championship in the U-23 category. Group A includes No. 16 Colombia, No. 2 Japan (defending U-23 World Champion), No. 5 Mexico, No. 6 Chinese Taipei, No. 9 Netherlands and No. 26 South Africa. Group A games will be played in Barranquilla, in the recently inaugurated Edgar Renteria Baseball Stadium. No. 3 Korea (2016 3rd-place finisher), No. 8 Australia (2016 runner-up), No. 10 Puerto Rico, No. 11 Venezuela, No. 12 Dominican Republic and No. 18 Czech Republic will battle in Group B. These six teams will compete in Monteria, at June 18 Baseball Stadium (Estadio de Beisbol 18 de Junio). The top three teams from each group will advance and go head-to-head in the Super Round. The schedule of games will be announced in the coming days. Edgar Renteria Stadium was inaugurated on 31 May 2018, with a four-team international event. In July, the stadium hosted the baseball competition of the Central American and Caribbean Games Barranquilla 2018, being named “The Jewel” of the event. June 18 Baseball Stadium is the home of Leones de Monteria, three-time champions of the Colombian Pro Baseball league. The stadium was inaugurated in 1955 and completely renovated in 2012. The U-23 Baseball World Cup will largely finalise which nations qualify for the top-tier “Premier12” 2019, as the Top 12 nations in the 2018 rankings will play in the major global event next year. Two years ago Japan conquered the first U-23 Baseball World Cup in Monterrey, Mexico, defeating Australia in the finale by a score of 10-3. Korea earned the Bronze. At the U-23 Baseball World Cup in 2016, National Team rosters included players from clubs affiliated to the most important professional baseball leagues in the world. The official tournament microsite U-23 Baseball World Cup has been launched at u23bwc.wbsc.org and is available in six languages (English, French, Japanese, Korean, Spanish and Traditional Chinese).